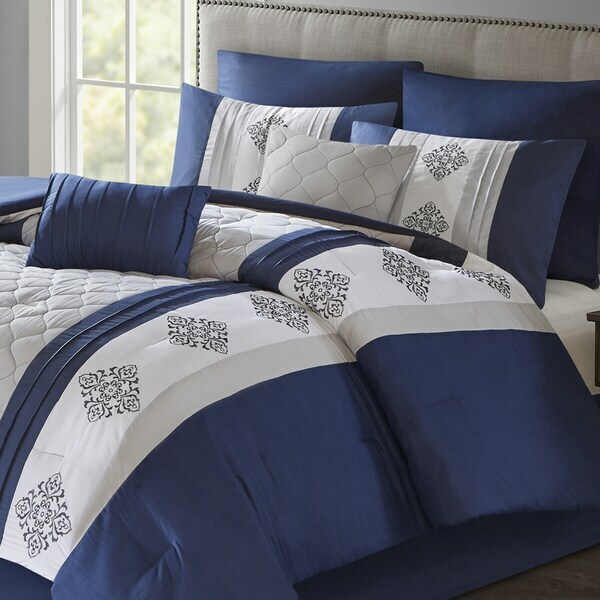 Strikingly elegant, the 510 Design Donetta Embroidered 8-piece Comforter Set brings a beautiful update to your bedroom. The comforter flaunts a pieced design with embroidery and pintuck details in rich navy, grey, and white hues for a stunning contrast. Matching shams mirror the design of the comforter creating a chic coordinated look, while a solid navy Euro shams complement the ensemble. Two embroidered decorative pillows and solid navy bed skirt provide the perfect finishing touches to the bedding set. Made from ultra-soft microfiber, this comforter set is machine washable and adds a luxurious touch to your bedroom decor. The comforter is pretty thin. I ordered a king size and it is really small on the sides, I would say it fits better on a queen size bed. Really like this comforter. White is a bright white, blue is a true navy embroidery is nice too. Not to heavy in weight! The quality of this bed set was an exceptional surprise. It was shown as a greatly reduced product and the original price would have been fair. This is a fine set but I had to return it since the blue color is much more of a navy than the bright blue shown in the photo. I needed a brighter blue to match some artwork and this darker blue just didn't cut it. However, it may be fine for someone else. This set is very cheaply made. It's made out of nylon and snags on everything. However, I'm using it for my guest room and it does what it supposed to do - covers the bed and looks very pretty. If I were using it on a daily basis on my own bed I would have returned it. Quality was not that great. Stitching as if it was irregular. I like the dark navy with the white and gray.